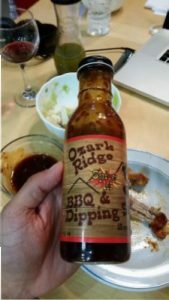 I’ve just enjoyed some chicken wings this evening, along with Ozark Ridge’s BBQ & Dipping Sauce, “Spicy 1X.” I’m not sure what “Spicy 1X” means, exactly. One thing I do know is that this sauce is not spicy, at all. It is sweet and tasty though. I like the consistency of this BBQ & dipping sauce. It’s nice and thick. The packaging is adequate, but I don’t see how it will separate itself from the competition sitting on a shelf. Nothing pops. Overall this is a nice, sweet sauce which could be useful in many different BBQ and dipping situations.